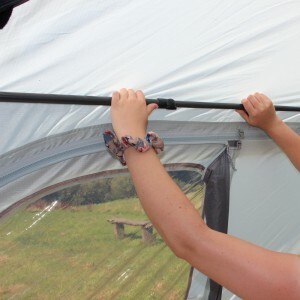 The Adjustable Roof Stretcher Pole Kit provides a convenient set of additional steel poles, which can be used to provide further rigidity and tension in the roof of the Movelite T1, Movelite T1 Tail and Movelite T3 drive away awnings, throughout adverse weather conditions, whilst ensuring proper posture of your model. These poles are designed for a snug fit on these models and therefore are not compatible with any other awnings or tents. They are not a necessity, which is why we have created them, as an optional extra for those customers who like to have peace of mind. The poles simply slot through sleeves in the roof; we recommend that you take these poles out when packing the awning away, just like you would any tubes/poles that are included in the awning. For maximum efficiency when packing, roll them up in the awning. Are you looking for the Adjustable Roof Stretcher Steel Pole Kit (for Movelite T1, T1 Tail & Movelite T3)? Designed Specifically to Fit 'Movelite T1', 'Movelite T1 Tail' & 'Movelite T3' Drive Away Awnings.